If you travel a lot for business and particularly overseas, you’ll understand the importance of packing light rather than carrying every convenience with you while you’re away. However, with modern technology continually advancing, travel devices have definitely upped their portability – by decreasing their size factor! From must-have charging tools and universal adapters to flash drives and streaming devices, here are our top 6 devices for business travel. In a world of slimline laptops and sleek smartphones, all the tech gear in the world is pretty useless unless you can actually charge your devices for business travel while you’re travelling! There are a huge array of different universal travel adapters out there, and unfortunately, some of them aren’t ideal. They are often unreliable, don’t fit properly, they’re too heavy or they have other flaws that mean you’ll end up having to buy one on the go when you’re overseas! Not ideal. However, advancements in technology have alleviated some of the downsides of many of the universal plug adapters on the market. Features to look out for include compact models that work in a range of countries, and ones that can deal with the full range of voltages. For example, if you’re travelling to the US where mains power is 110 to 120 volts or to other countries that use 220 to 240 volts, you’ll need to check what your individual devices can handle. Devices like phones and e-readers can normally be charged on your laptop via USB, however, if you need to use a wall charger, you’ll need to do your research. 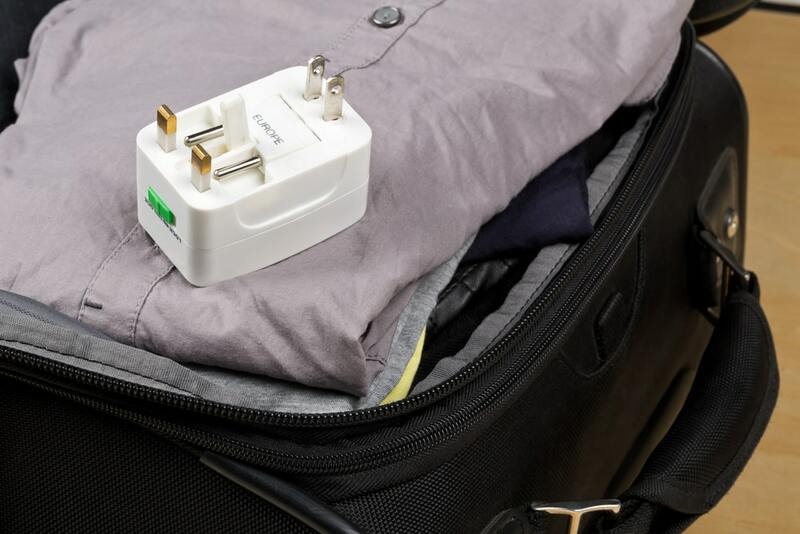 Outlets aren’t always convenient or readily available when you’re travelling and particularly on international trips where you might also need an additional adapter to get the plug to work. The solution? A charged USB battery pack. These essential travel devices will keep all your gadgets suitably charged and if combined with a portable surge protector will turn the only outlet in reach in your hotel room into multiple charging stations. They are also useful if you spend a lot of time out on the road, particularly if you need to use your phone’s GPS to navigate as this can drain a battery quite quickly. They are also useful if you are travelling on a budget and plan to use public transport – you simply charge up while you’re in transit on a train or a bus. Decent battery packs should be small enough to toss into a bag, come with built-in cables, and keep your devices topped up all day. More expensive models also come with USB ports and work as port extenders as well. Also known as a thumb drive, flash drives are one of the essential travel gadgets that come in handy for a number of occasions while travelling. These include things like accessing a photo of your passport if it’s lost or stolen or sharing a document with your hotel’s reception in order for them to print it out for you. There are literally thousands of options on the market and fast, large capacity storage and high-quality media these days are available at an affordable price. From standard USB 3.0 flash drives to models that can store hundreds of photos, movies and even your entire hard drive, many of them are also extremely compact. Whether your priority is size, speed, durability, reliability or security (or a combination), there’s a flash drive out there for virtually every type of traveller. Streaming sticks are palm-sized gadgets that connect directly to a TV’s HDMI port and use Wi-Fi to stream all types of media that you can control with your phone. TV and many cable, broadcast or pay-per-view hotel services leave a lot to be desired! In terms of gadgets for business travel, streaming sticks and media streaming devices allow you to watch your favourite flick after a tiring day in business meetings or load up your own media service provider account to binge watch your favourite series while you’re out of town. Those that travel frequently for work know that a decent pair of noise cancelling headphones are an essential travel gadget that can make all the difference to a business trip. It can turn a flight into a relaxing and pleasant experience compared to one that’s filled with chatty fellow passengers or roaring engine noise! At the very least, they’ll dull external noise so that you can play your favourite tunes or get some sleep, particularly on long-haul flights. Available in wired and wireless models, features to look out for include a long battery life, ear comfort and of course sound quality and noise cancelling capabilities. You’ve also got the option of choosing from headphones, earphones and earbuds and over the ear and on-ear models. Pricier models also include volume controls on the cable and plugs that allow you to connect to your smartphone, tablet, hi-fi system and/or games console as well. OK, perhaps not a necessity but still a pretty handy gadget for business travel that may make a world of difference to your travel experience, particularly if you have trouble sleeping. Not just for unsettled newborns, white noise devices and even apps can mask out barking dogs, late night traffic and other unusual hotel sounds. These products can produce soothing sounds like rain, wind, ocean waves or music (to name a few), and the sounds they produce are often modulated by white noise. The sounds that are generated aren’t always truly random either. You can choose which audio suits your needs best and the device will continually loop the audio track at your chosen volume. Pack a portable Bluetooth speaker as well and you’ll be sleeping like a baby! Your travel devices have helped you enjoy a relaxing business trip. Now it’s time to head home! CitiCar has all your business travel needs covered with our range of chauffeured cars and people movers! Get in touch today on 1300 661 119.